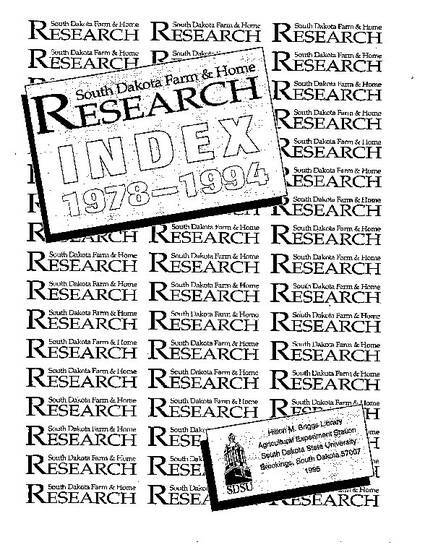 South Dakota Farm &Home Research Index 1978-1994 aids researchers, extension personnel, historians, librarians, and others in locating information about the research of the state's Agricultural Experiment Station. It facilitates the identification of articles describing relevant research and researchers. South Dakota Farm & Home Research has been published by the Agricultural Experiment Station, South Dakota State University, Brookings, since 1949. The quarterly journal features brief reports on a wide variety of experiment station and university research activities focusing on agriculture and home economics. This index supplements the previous index to South Dakota Farm & Home Research, compiled by Leon Raney and Jane Kinch, which covers 1949 through 1977. It provides subject and author indexing of the contents of the journal from 1978 (volume 29, number 1) through 1994 (volume 45, number 3). All articles published in the journal during those years are indexed, resulting in approximately 1,900 subject and author index entries. All subject headings were assigned by the indexers. Although some title words may have been assigned as subject headings, this is not a title-keyword index. Approximately 450 subject headings appear in the index, including many cross-references, i.e., "SEE" and "SEE ALSO" references. Most articles are listed under more than one subject heading to facilitate access. The author index lists articles under the names of all authors or coauthors. Therefore, an article written by five coauthors, is listed in the author index under each of the five names. Articles which do not identify the author(s) are not listed in the author index.